The woman who had come with Jesus from Galilee followed Joseph and saw the tomb and how his body was laid in it. Then they went home and prepared spices and perfumes. But they rested on the Sabbath in obedience to the commandment. It’s Holy Saturday. We’ve tasted the Holy Communion. We’ve heard the hammer pound the nails. We’ve watched the Roman soldiers role dice. We heard Jesus’ last words. Finally, a violent storm. And now we wait. This Holy Week, I’ve been able to participate in a variety of services. For the first time in many years, I was able to take in some services which I didn’t have to organize. As much as I love planning Holy Week, it is nice to see how other folks interpret the events. At one service, it ended with a man portraying Luke and something like this: “The story has been given to us. What are you going to do with the story?” He’s right. We have heard the story many, many times. The Bible provides lots and lots of witnesses. Do we choose to believe? And if we believe, does the story change how we live our lives? Even the thief changed how he lived his life in his last moments. One thief continued to be arrogant. The other thief chose humbleness and humility. Jesus promised him a great reward. I pray we don’t have to wait until the last moments of our lives to recognize the need for change in how we live and the choices we make. I am confident God can allow many, many good things to happen in our lives … if we are humble enough and accept a role of humility to let this be our chosen path. When the UW-Madison men’s basketball team made it to the Final Four, a sports reporter asked Frank Kaminski, the UW’s 7” center, to describe his team in two words. He chose, “White boys.” Rick and I got a huge chuckle out of this. Pick two words to describe the events of Holy Week. Right now. Pause and write them down before reading any further. OK. Look at your words again. Cement them into your brain and heart. In your heart of hearts, this is what you believe the Easter story is about. Pray these words to God, over and over, thank God for these two words. Now, here are my words: God’s love. Lord God – thank you for your amazing love. Thank you for all the minute details of this story and how each one helps us get a wider picture into who are and the great depth of love you have for us. As we wait tonight, grant us patience to see your love. Amen. 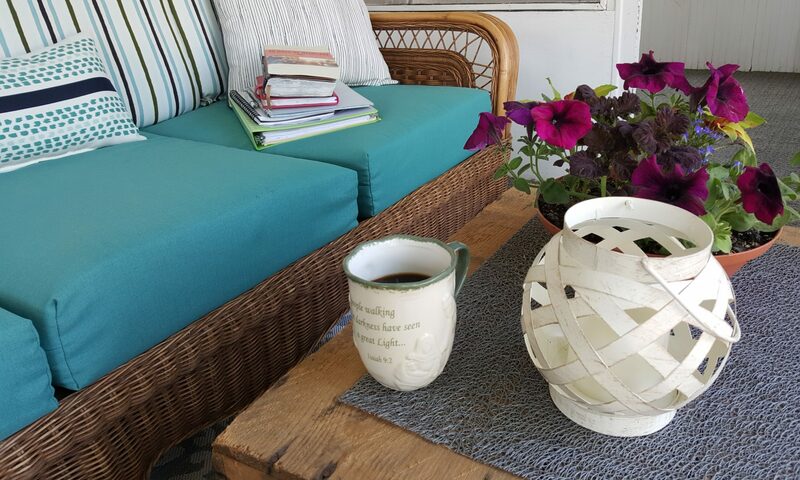 If you have enjoyed this blog, please pass it along to someone else who might also enjoy it. Going to Pilate, he asked for Jesus’ body. Then he took it down, wrapped it in linen cloth and placed it in a tomb cut in the rock, one in which no one had yet been laid. It was Preparation Day, and the Sabbath was about to begin. It is a video that talks about why we have Easter eggs. It shares some history, perspective from kids and worth the five minutes to watch. I know it’s Maundy Thursday but thought this video would be great for folks to watch BEFORE Easter. Use some of the info with your little ones as you color and hunt for eggs in the next few days. Enjoy! Lord God – While we aren’t able to peer into the tomb and see the body, we can use Easter eggs as a symbol to represent and help us understand your death and resurrection. Thank you for this long standing tradition. Encourage us to remember the true meaning behind these symbols this Holy Week. Amen. Christmas was barely over when our grandson Waylan began his pitch for his birthday present. Multiple times in the last few months, he has specifically told me what he would like for his birthday: a blue rainbow loom. About two weeks ago, he told me again. This time, I asked him if he’d told anyone else about his passion for a blue rainbow loom. He informed me that he was planning on me, and only me, on getting him the loom. Tomorrow, Waylan turns 7. With it being Maundy Thursday and he having school, I knew celebrating his birthday tomorrow would be tricky. So, we celebrated last weekend. He informed us that his birthday was this week. And then he said, “And it’s the blue rainbow loom I want, Dianne.” I didn’t clue him in that this exact loom was riding in the back of my vehicle, wrapped in green birthday paper. Accompanying the loom was a blue box to store the little rubber bands, about 10 packages of bands and a book with instructions on how to make an accurate fishtail pattern versus a double hexagon. We let Waylan choose the location for lunch. I don’t think the location was all the important. He just wanted to open his present as soon as we had ordered food. Waylan tore into the box and was not disappointed when he discovered a blue rainbow loom. He literally hugged the box and then couldn’t get the box ripped open fast enough. Waylan would have been content to stay at McDonald’s all afternoon with his rainbow loom. Eventually, we left and went to Baraboo. The plan was to let Grandpa nap while the kids and I went through the zoo and spent time at the playground. We went to the small zoo first. When we headed towards the playground equipment, Waylan asked if he could get something out of the car. He came back carrying his loom and the organizing box. As sister Ellie swung and went down the slide, Waylan worked on rainbow loom project. Often, he asked me what color of bands he should use together. At times, I helped sort the bands by color. When we decided to walk down by the river, Waylan carried his organizing box like it was the most valuable thing he owns. When Ellie would find something to entertain herself for a while, Waylan would break open his organizer and continue on his latest project. Several times over the course of the afternoon, Waylan exclaimed to me, “Dianne, this is THE. BEST. PRESENT. EVER.” It was enjoyable to observe him, a soon-to-be 7-year-old boy enthralled with making rings and bracelets from little rubber bands. More than once he said that his organizer is a replica to one his school friends has. But Waylan has more bands. I wondered how long this phase of making things with the loom will last. When will he move onto the next cool thing? I don’t know. But for now, the blue loom is THE. BEST. GIFT. EVER. By a long shot. What is YOUR BEST GIFT EVER? Would it take long for you to imagine what you would choose? For me, the best gift ever is what we remember and celebrate this week: how God sent his son into this word to redeem all people. I just hope that I can be half as excited about this gift throughout the week as Waylan is about his seemingly BEST. GIFT. EVER. May we be amazed with the gift you have given us. May we never grow tired of it. Amen. Then Jesus uttered another loud cry and dismissed his spirit. Yesterday, one of the churches I serve had a community Easter Egg Hunt. It was a great day. A special joy was taking two of our grandkids to the hunt with us. The kids enjoyed games, a craft, snacks and of course, hunting for eggs. 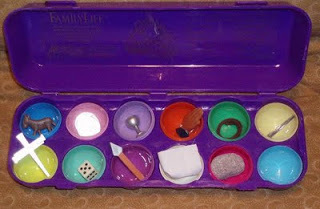 They also each got to make a box of Resurrection Eggs. Resurrection Eggs are an egg carton with 12 plastic eggs. Inside each egg is something that helps tell the Easter Story: a donkey, praying hands, a crown of thorns, a nail, a dice, a piece of linen, etc. The last egg is empty, representing the empty tomb the women found on Easter morning. After the Easter Egg Hunt, Waylan, Ellie, Rick and I were in the car. Waylan was intrigued with his new birthday present (a BLUE rainbow loom). Ellie had her Resurrection Egg Carton on her lap. She went through the different pieces of the resurrection eggs, asking Grandpa what each piece represented or telling us what they stood for. She went through her egg carton once. Then twice. A third time. Over and over, she kept going through the various pieces, wanting to make sure she had the right purpose for each time. A couple times, she’d ask Grandpa a second or third time why a particular item was in the egg carton. He’d gently remind her. The entire purpose and need to share these stories with little people was re-enforced for me yesterday. From our granddaughter, as she sat with her egg carton of Resurrection Eggs while we drove down the road. At the egg hunt, one of the teenaged boys found a little miniature pink bunny rabbit. He asked Ellie if she wanted it and she gladly accepted. Later in the afternoon we were in the car again. Ellie was now playing with the bunny. “Dianne, the bunny had to die,” she said. “He just had to die.” I’m not sure if the stories were getting mixed up so much as she was transferring one story to the next. I do believe she has the understanding that Jesus died and there was a reason behind his death. Not bad for a three-year-old. 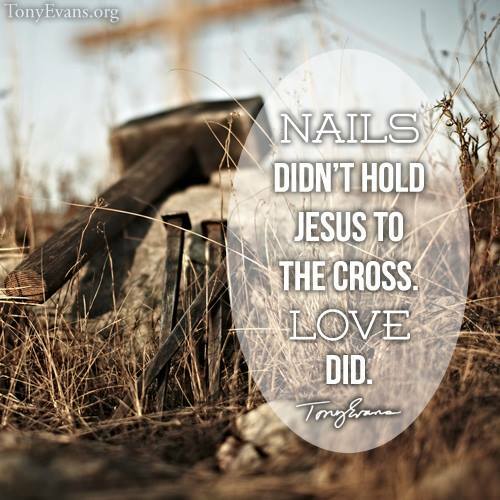 Lord God – I pray the story of Jesus’ crucifixion never gets old for us. Help us to see the story with new eyes, new depth, new understanding this Holy Week. Assure us it’s OK if we don’t quite understand why everything happened or the meaning behind it. Just give us faith the size of a mustard seed and intrigue enough to keep examining this story over and over. Amen. Today, I’ve been thinking about the phrases Jesus said from the cross: “It is finished.” We often envision Jesus finally resigning to the fact that he is going to die. He musters up just enough energy to finally admit defeat. I think Jesus had a completely different approach. It was not finally giving in. I believe he said these words of complete victory. It’s a shout of celebration! It’s done! Complete! Enough! Ye-haa! Let the party begin! It struck me today that Jesus did not say is “I am finished.” IT is finished. No more meetings. No more teachings. No more answering dumb questions. No more trying to outwit the Sanhedrin. No more putting up with people who really don’t want him around. He’s finished with all of it. So then, what is the purpose of the cross? It’s also enough for us. I hear him telling me and you that he has accomplished everything we need. God gives us everything we need and more. The problem is that most of us spend our lives trying to remove God from having control when all Jesus wants us to do is turn control over to God. We pack our lives with one more thing so we don’t have to deal with turning control over to God. We want to brag that we have one more meeting. We want to be overrun by a too busy schedule. We want others to sympathize with us when we have to say “no” to something that is good. But hear Jesus’ words again. It is enough. We don’t have to do anymore. I find this discovery a bit ironic, considering Holy Week is upon me, one of the busiest weeks of the year for a pastor. For this moment, Jesus is enough. Thanks be to God. Finished. Done. Complete. You overcame it all just for me. Thanks be to God. Amen and amen. Jesus knew that everything was now finished, and to fulfill the Scriptures said, “I’m thirsty.” A jar of sour wine was sitting there, so a sponge was soaked in it and put on a hyssop branch and held up to his lips. Growing up, I remember that each year, a family from Chicago would come to our farm and butcher a lamb shortly before Easter. The Dad butchered the lamb right on the farm and would not cut the lamb up. They also kept some of the lamb’s blood. It all seemed a bit strange to me. It was not until years later, when I was a pastor and preparing for Holy Week did I realize what this family was doing. They were Jewish and they were preparing for the Passover Meal. The first Passover Meal was celebrated hundreds of years before Christ, when Moses was trying to lead the Israelites out of Egypt. Pharaoh would not let his main work force, the Israelites, go. God sent nine plagues to the Egyptian people. After each plague, Pharaoh’s heart just got harder and he continued to refuse to let the Israelites go. It was time for the tenth and final plague: the killing of the oldest son in every family. To ensure that the eldest son in Jewish families was not killed, each Jewish family butchered a lamb and kept some of the blood. They roasted the entire lamb over a fire and bake bread with no yeast in it. Finally, they ate the Passover Meal standing, with their sandals on and their walking sticks nearby. For as soon as Pharaoh released them, they were to leave town. But there is one other part of the story. 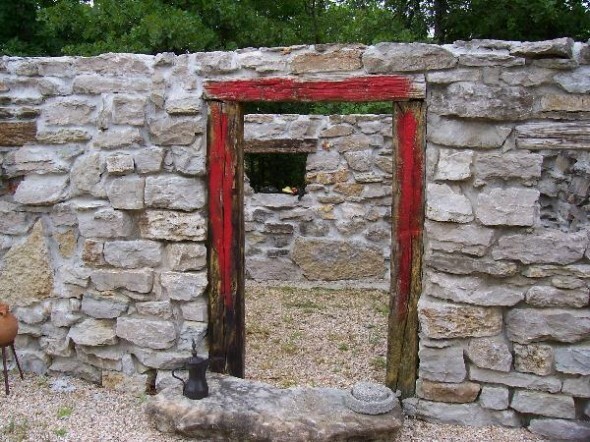 Each Jewish family was to take some of the blood from the lamb, use a hyssop stick and paint blood around the doorframe of their house. As the Angel of Death passed over the land, it would “pass over” the homes with blood around the doorposts. Instead of the eldest Jewish son dying in every family, the lamb is sacrificed. The blood is the symbol of the sacrifice and a reminder that there was a cost, even for Jewish families. Fast forward to Jesus’ crucifixion. Jesus professes he is thirsty. How interesting that a sponge on the end of a hyssop branch is dipped into sour vinegar and offered to Jesus. Is it simply ironic? Of course not. The hyssop branch points us back to the original Passover meal. Rather than a lamb being sacrificed this time, Jesus becomes the sacrifice for our sins. His blood replaces our blood, just as the lamb’s blood replaced the eldest son’s blood at the time of the first Passover. How I wished I had understood what this Jewish family was doing when they came to our farm. It would have been interesting to know more about their Passover traditions. I think of this family every time I prepare a Seder Meal for Maundy Thursday. More importantly, I pray that I see the sacrifice Jesus made for me then and now. O Lord, you are the sacrificial lamb that takes away the sins of the earth. As Holy Week gets closer, may this only become more real for me. Amen. One of my favorite parts of spring are baby lambs. While my sisters and I were growing up, we raised sheep. When the lambs were born, we knew that we would become attached to them. We also knew that often they would be sold; either as breeding ewes or lambs to be slaughtered for meat. I know. It seems cruel to kill a cute baby lamb. But this was part of the deal in raising our lambs. My sister Debbie and nephew Kevin continue the Deaton tradition of raising lambs. 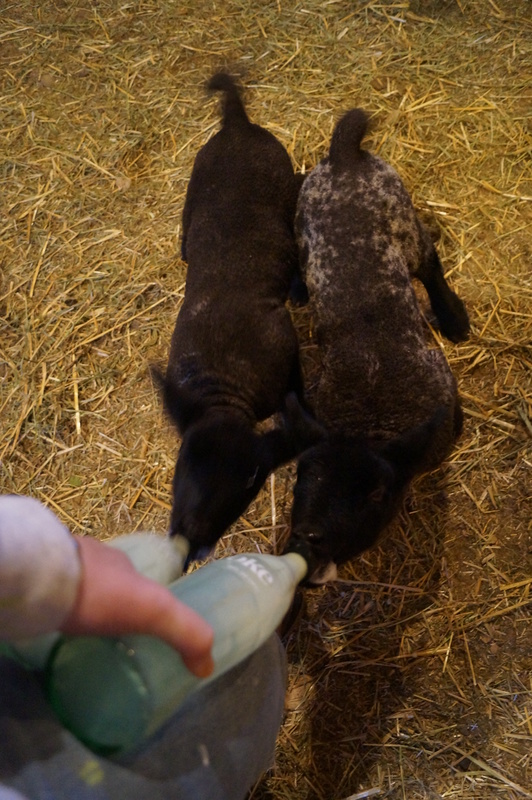 This year, they have a couple bottle lambs. This means the lamb’s mother died shortly after giving birth. Now, Debbie and Kevin have accepted responsibility to feed the girl and boy several times a day. 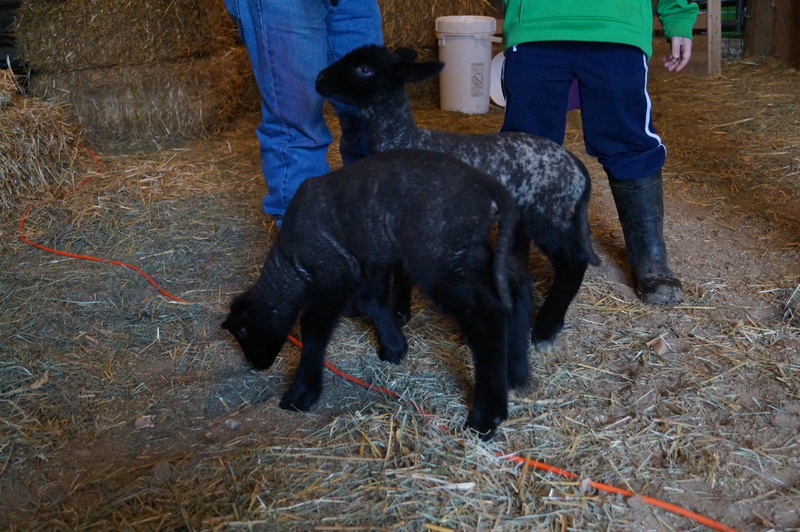 When Rick and I were there recently, the lambs came running to the gate as soon as the door opened. They knew it was lunch time. They drink like there is no tomorrow. Even though it had been just a few days since losing their Mom, they already considered Debbie their Mom. They followed her around the pens, pleading for more milk and attention after their meal. Lambs were an important part of the Jewish culture when Jesus lived. Many Jewish people earned a living as shepherds. It wasn’t a glorious job but someone had to do it. Because of their intimate knowledge of sheep and shepherding, Jesus often used sheep as a metaphor to help the people understand who he was. In John’s Gospel, Jesus has barely begun his ministry when John the Baptist sees him and calls him the Lamb of God. This was a terribly profound statement. The Lamb of God is the one who takes on the sins of all the people. Before Jesus has performed a miracle, healed anyone or began to explain the Kingdom of God, John sees who he is. Just like the orphaned lambs see who Debbie is. Their pseudo Mom. Their caregiver. Their source of nourishment. Their safe place in a world that turned out differently than anticipated when their Mom died. Yes, Debbie has limitations on just how much she can provide. But she is doing everything possible to make sure they grow up and become useful. Jesus does everything possible so that we can grow up in our faith and become useful for God’s kingdom. Here’s the question: do WE see him as the Lamb of God? Do we follow him looking for regular nourishment? Do we stand at the gate, just waiting to see what Jesus will do with our lives? Do we see him as a safe place in this cruel world? I pray so. Oh Lamb of God: thank you for taking away my sins. Thank you for wanted to nourish me, care for me, love me. May I see how you never leave me as an orphan. Help me see just how much you want to be my shepherd this Lent. Amen. They are back. And have been for a couple weeks. 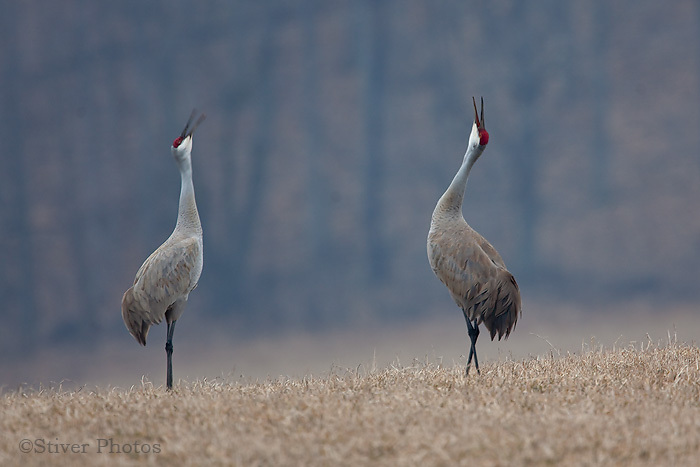 Several times recently, I have seen Sandhill Cranes here in Wisconsin. These tall, thin-legged beautiful birds are well-known in our neck of the state. When Rick and I lived in the country, we could often hear cranes in the marsh not too far from our house. Sandhill Cranes are interesting birds. They mate for life. The fly south for the winter (sometimes guided by a human on a flying machine) and return to generally the same area every spring. They have been protected to try and repopulate them. And now they are home. Well, what I consider home. I’m not sure if “home” for them is here in Wisconsin or down south. I like to think their Wisconsin home is what they consider home. What is home for you? We often think of this as the house in which we were raised. Grown adults will talk of “going home,” meaning returning to the location where they were raised. I enjoy my Mazomanie home. It is comforting to walk in the door after I’ve been gone for a day, two days or several. It is the place where I can control where things are, if it’s clean or dirty and how I decorate. But in the end, it’s still just a house. Where is home for me? In God’s family. It’s less about a physical building and more about believing in something with others that holds us all together. Maybe the cranes consider both their Wisconsin and southern locations “home.” Maybe it’s less about the location and more of a peace of heart. It’s wherever God is. Lord God, help me to feel most at home wherever you are present. May it be less about a physical building and more about a peace within my heart. Amen. During the night God spoke to him in a vision. “Jacob! Jacob!” he called. “Yes?” Jacob answered. “Dianne, why do you talk so loud to Grandpa Great?” our little three-year-old Granddaughter Ellie asked me. Rick and I enjoyed having the three Rock Springs grandkids one day last week. Grandpa Great (Rick’s Dad) likes to see the kids also. We spent most of the day at his house with the three youngest Vielhubers. Like many retired farmers, Rick’s Dad, Tony, has problems hearing. Despite significant effort in trying to improve his hearing, he still struggles. Out of habit, I speak louder when I talk with him. We were all at the kitchen table. I don’t remember what I said to Tony. I don’t remember if he heard me. What I remember is Ellie noticed that I talk louder to him than I do with others. Maybe she thought I was speaking poorly to him. Or maybe that I was yelling? I tried to quickly assure her I do this only because Grandpa Great doesn’t hear well. I am trying to help him and not hurt him. This little conversation with Ellie got me thinking. How many times has the Lord God tried a get my attention … and I wasn’t listening? Or I didn’t want to hear what God was telling m? Or I just tune God out? Hmm. Guilty as charged. Often, people say God does not answer their prayers. I think God answers our prayers far more often that we care to admit or realize. Sometimes, we just don’t have our hearing aids in. Or we purposely don’t like to hear background noise, so we leave them out. Or what we hear isn’t the answer we like, so we simply pretend the information never came our way. I’m afraid that Tony isn’t the only one with a hearing problem. I too have selective hearing. Lord God, I cannot imagine how many times you’ve tried to speak to me and I failed to listen. I pray that as Jacob heard your voice when you spoke to him, that I will distinguish and hear your voice above all others. Help me not to use selective hearing when it comes to your voice and guidance in my life. Amen.